Note: This article was first published on 19th September 2017. 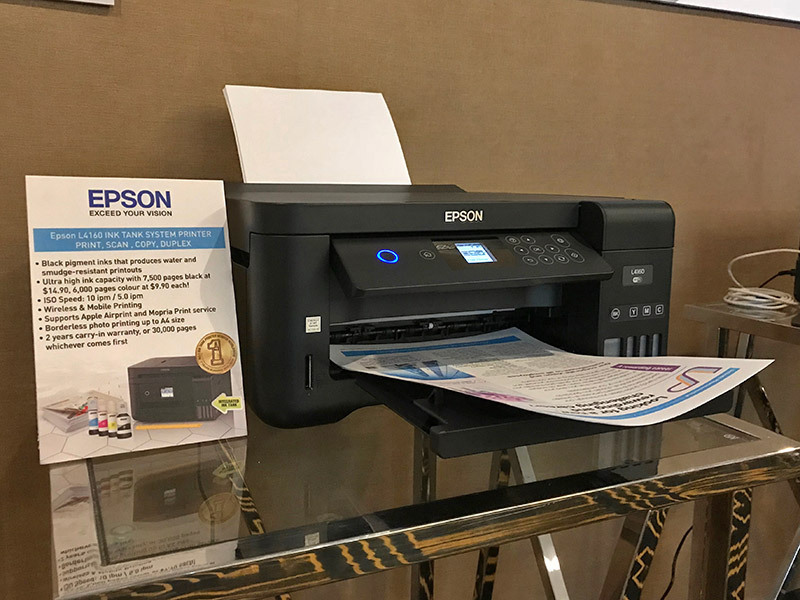 In the last few years, Epson has poured most of its consumer printer efforts into its L series, which is a range of inkjet printers that uses “ink tanks” instead of snap-in cartridges. In a nutshell, these L series ink tank system printers are designed to overturn the longstanding notions that inkjet printers can’t print a lot and their inks are expensive to replace. In the L series’ case, the printers are fitted with large ink tanks that hold a generous amount of ink, which means they’re able to print several thousands of pages. This is in stark contrast to the few hundred pages typically associated with inkjet printers using cartridges. Secondly, when the inks run out, there are no cartridges to toss out for the L series printers. 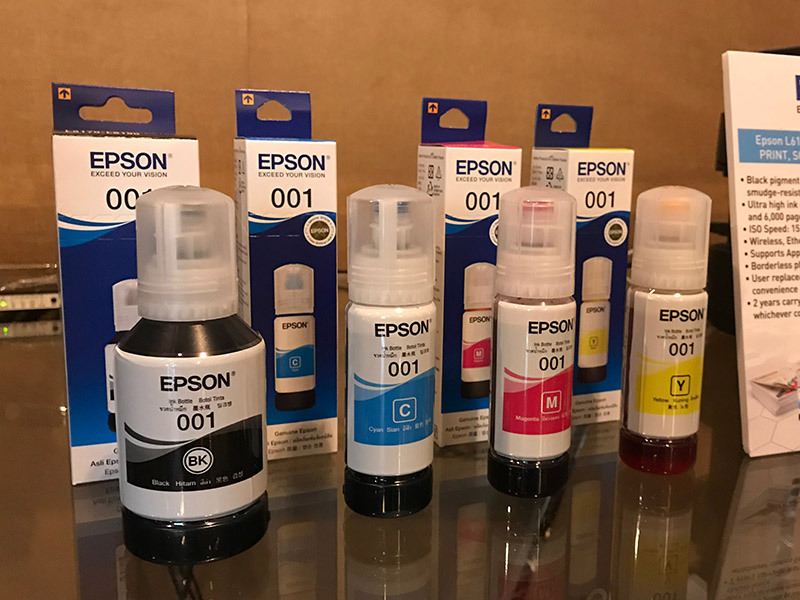 You simply get refill bottles from Epson - which are affordably priced - and pour more into the ink tanks. 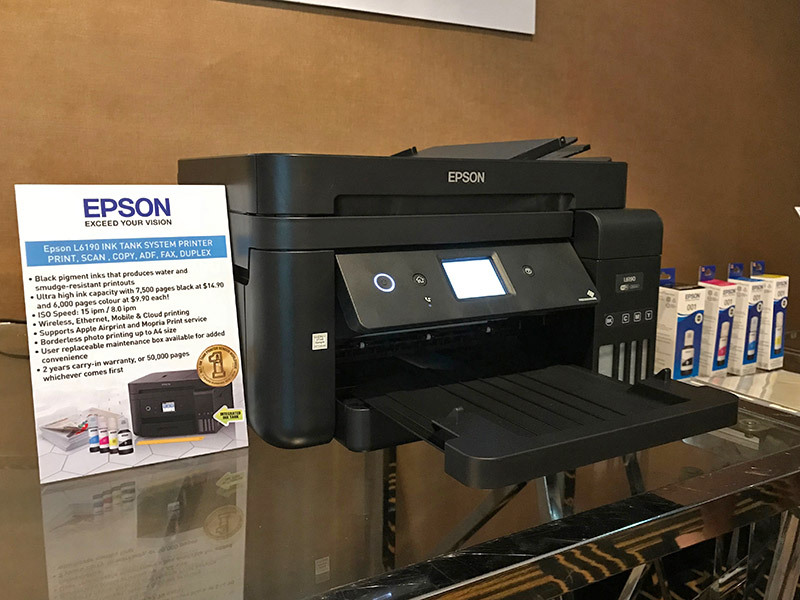 With demand for such ink tank printers on the rise, Epson is keen to offer more options to its customers. 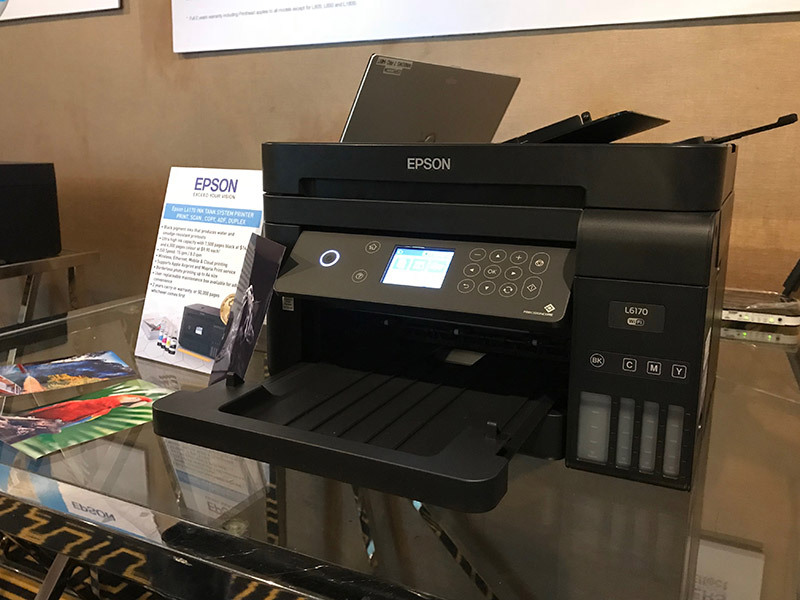 Epson currently already has a 18-model strong lineup that caters to home, home office, and small business requirements, but today, the Japanese electronics company has unveiled five new next-generation models that offer faster speeds, enhanced features, and a new integrated ink tank design. They’re the L4150, L4160, L6160, L6170, and L6190. For a start, the flagship L6190 is a 4-in-1 device with print, scan, copy, and fax functions. 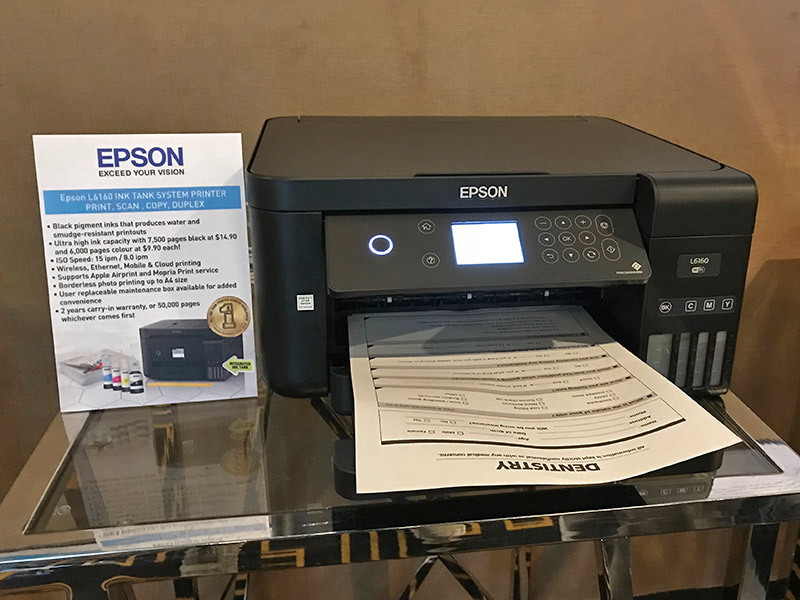 Targeted more at the SMEs, it’s equipped with a 30-page automatic document feeder (ADF) and a 250-sheet paper tray, a 2.4-inch touch panel, and supports double-sided printing (a rarity for ink tank printers). 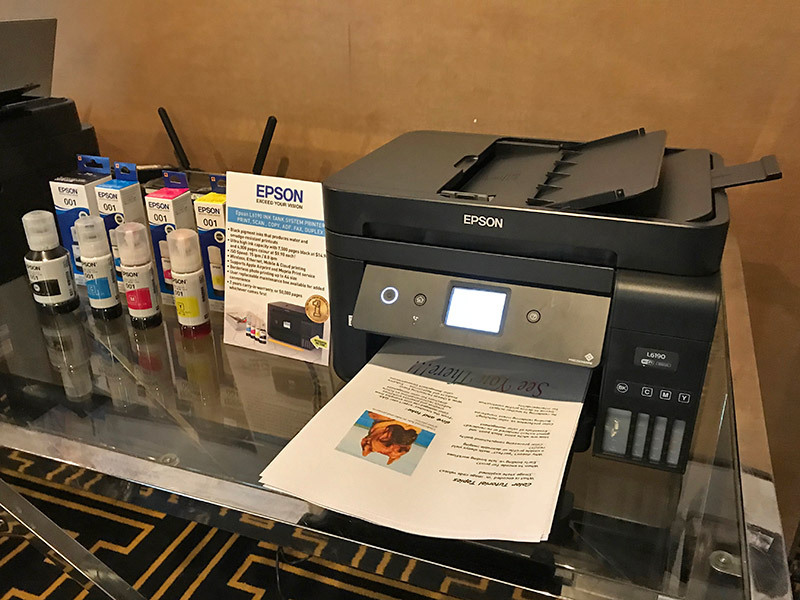 In addition to Ethernet and USB connectivity, it supports Wi-Fi and Wi-Fi Direct, so it’s easy to print from smartphones or tablets using Apple AirPrint, Google Cloud Print, Mopria Print Service, or through the free Epson iPrint app. 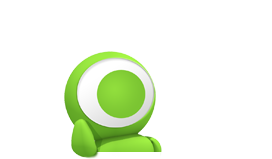 You can also scan files and upload to the cloud for later retrieval. The L6190 uses Epson’s advanced PrecisionCore printhead to maintain a high print quality and a top resolution of 4,800 x 1,200 dpi. 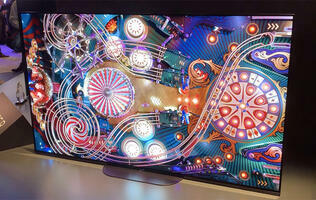 ISO print speeds are rated at 15 images per minute (ipm) for mono and 8ipm for color. For better blacks and water resistance, its black ink is pigment-based while the color inks are dye-based. 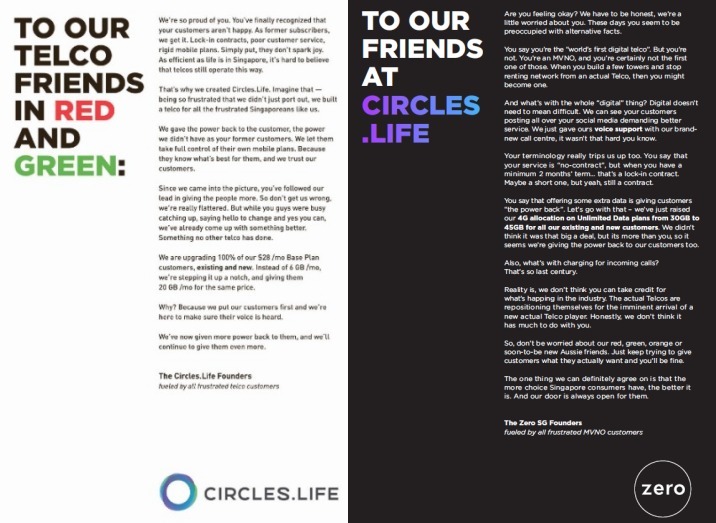 Borderless printing up to A4 size is also supported. On a related note, I like that Epson has finally gotten to refine the case design of its ink tank printers. For one, the ink tanks are now moved to the front to blend in better with the printer. Previously, the ink tank housing was like this giant, clumsy, orphan attachment that Epson has to bolt to the printer’s side because it couldn't figure out what to do with it. 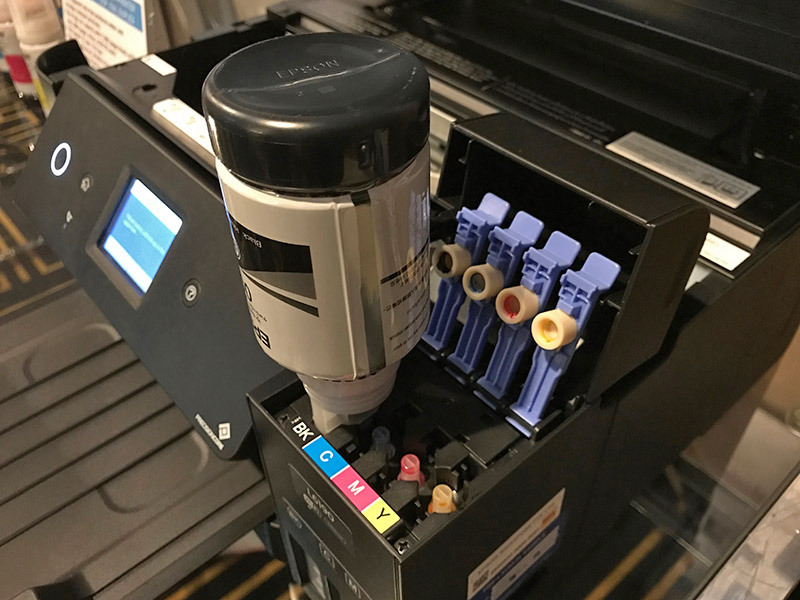 It may be a small change on the grand scheme of things, but the benefits are obvious: a smaller footprint and the ability to quickly check the ink levels from the front. But it’s not just the aesthetics. 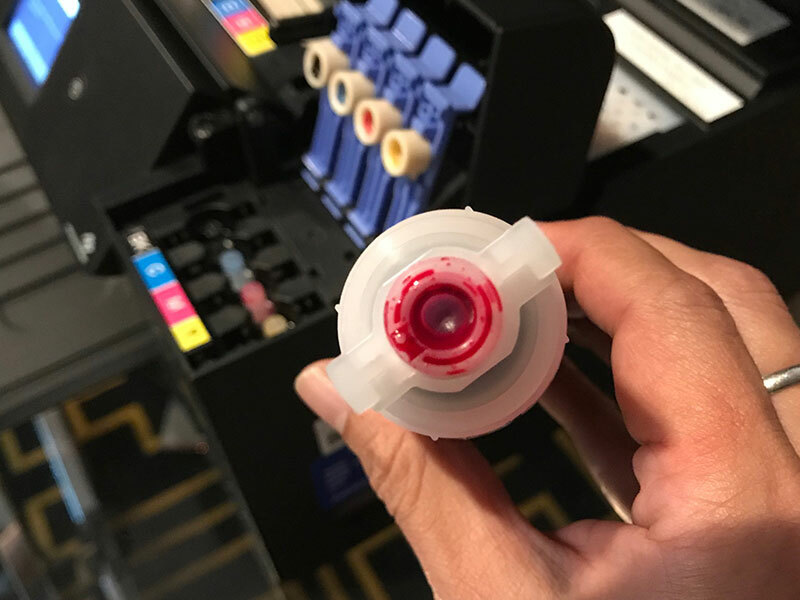 The ink filling system has been re-engineered to minimize the risk of spills, and the nozzle of each ink bottles is now different from the others to prevent you from refilling an ink tank with the wrong ink. The printer also comes with a user-replaceable maintenance box, so there’s no need to bring the printer down to the service center to have it replaced. Moving down the lineup, we’ve the L6170, which is very similar to the L6190, with a few key exceptions: it doesn't do fax, the 2.4-inch LCD isn’t touch-enabled, and it has a smaller 150-sheet paper tray. Other than that, its PrecisionCore print engine, connectivity options, bundled ink sets, etc. are identical to what you get on the L6190. 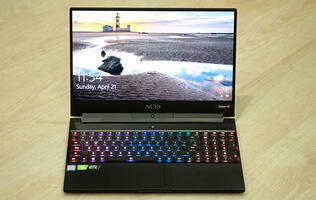 And then we’ve the L6160, which is basically an L6170 minus the 30-sheet ADF. The most compact model of the trio, you can still do scanning and copying with the L6160’s flatbed scanner, just that multi-page jobs will take longer since there’s no ADF that you leave a stack of documents on. Otherwise, it prints at the same rate as the L6170 and L6190, and uses the same ink tank system where one set of black ink is able to print up to 7,500 pages in black-and-white, and one set of (three) color inks is able to print up to 6,000 pages in color. Remember too, each bottle of black ink only costs S$14.90, and each bottle of color inks S$9.90, which amounts to S$44.60 for a full set on replacement inks. 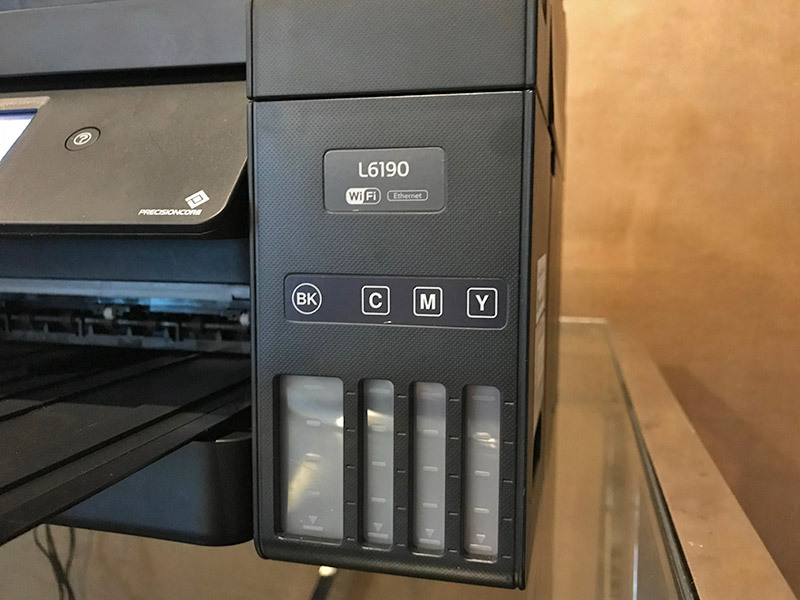 Then we’ve the L4160 and L4150, which are designed more for home users who don’t necessarily need the fastest print speeds and the business-oriented features, but who typically worry about printing costs whenever they print, be it family photos, recipes, or the kids’ homework. The L4160 is a 3-in-1 device (print, copy, scan) with a print speed of 10.5ipm for black and 5ipm for color. It has no ADF, but relies on a flatbed scanner for scanning and copying jobs. It also sports a 100-sheet paper input tray (or 20 sheets of photo paper) and supports both duplex and borderless printing. USB, Wi-Fi, and Wi-Fi Direct connectivity are all onboard, and you can also print directly from the built-in SD card slot. The printer comes with an Epson Creative Print app, which lets you customize and share photos with personal messages. Creative Print can also access and print Facebook photos, create collages with photos from Instagram and mobile devices, as well as create custom greeting cards. Sporting the same integrated ink tank system design as the aforementioned business models, each full set of inks can print up to 7,500 pages in black and 6,000 pages in color. But while the printer has a top resolution of 5,760 x 1,440 dpi, it doesn't use the PrecisionCore printhead. 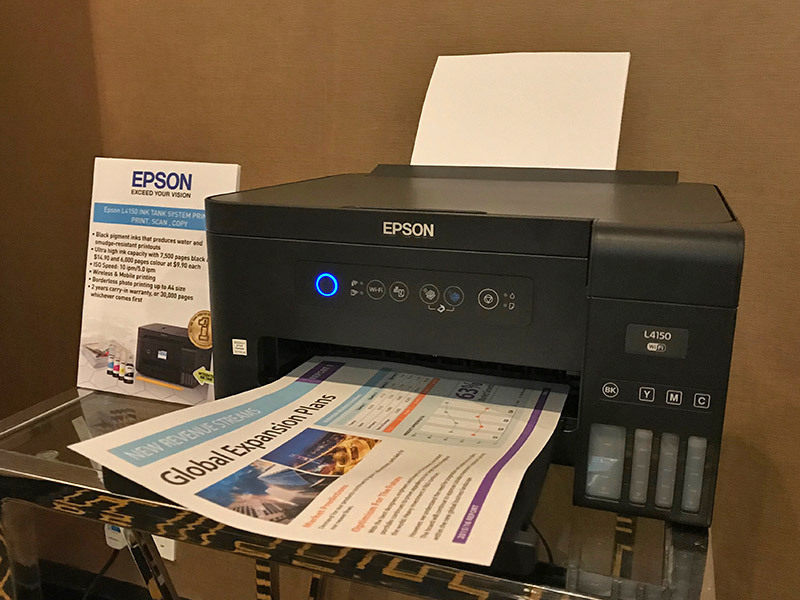 Last but not least, the L4150 is a basic 3-in-1 multi-function model that also supports wireless and mobile printing, borderless printing, and the Epson Creative Print app. While it uses the same print engine as the L4160, it’s missing the L4160’s built-in memory card slot, 1.4-inch LCD display, Apple AirPrint support, and automatic two-sided printing (you’ve to manually turn the page over). If you only care about printing costs and don’t give two hoots about these missing features, this model makes a lot of sense.